Today, after lunch, I asked Esme if we could have coffee at the roof. We also shared a pomegranate. Not my favorite fruit, especially since you have to be careful not to eat the white stuff holding the seeds which has an unpleasant bitter taste. Esme spotted a lot of smoke in the far distance, above a hill. Later, I found charred pieces of plants on the roof. It must have been quite a fire. In the evening her mother told us that people probably burned down sugar cane plants after harvesting. After I finished my coffee in the sun, I started to stack the bricks I had been looking under and between for a scorpion a few days ago. 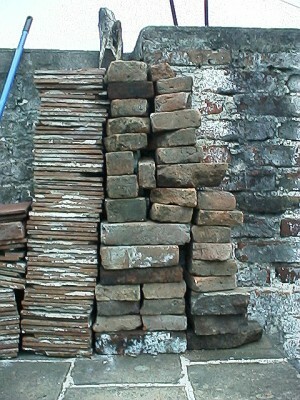 Instead of stacking them up high, I decided to make a low construction with tiles between the levels. 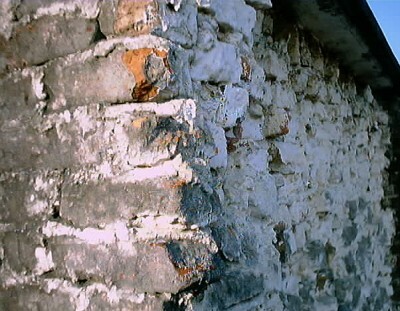 I had found a scorpion under the stack of bricks before, somewhere in May 2004. 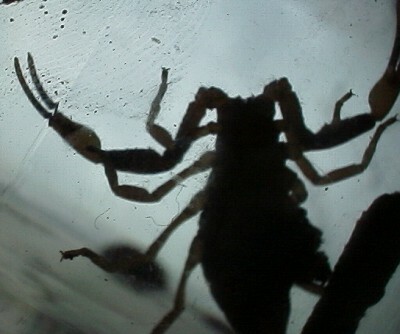 However, in the night of that day, poor Georgio (as Esme called it) was attacked by my first, and bigger scorpion, Tina. The stinger of Tina was buried in Georgio's back. I used a plant sprayer to break up the fight and put Georgio in a plastic container. However, after some time it became clear that Georgio was dying. Tina, in the mean time, was looking around like crazy for her meal. So I decided to put Georgio back and let Tina eat it. After creating a new construction of bricks and tiles to the left of the huge tile stack (see first picture) I decided to look behind (and under) the tile stacks. Behind it was a huge piece of wood, some smaller pieces of wood, stones and other stuff. Esme was looking when I finally moved away the last tiles, and then we saw it, running away towards my just finished stack of bricks. A big scorpion, clearly bigger than Tina. Esme thought she saw a smaller scorpion too. I didn't see a small scorpion, but I saw a silverfish so I guessed she was mistaken. Also because scorpions can be cannibalistic as I have seen with my own eyes. I went down to our apartment (yelling: "We got a Tiiinaaa") to grab a plastic container, a piece of paper and a dustpan with brush. Back up, I broke apart the nice construction I made ten minutes ago. When I removed the big tiles that where on top of the bottom layer of bricks we clearly saw a tail with stinger ready to strike. I removed the rest of the stones, carefully. The scorpion stayed under the brick. I grabbed the plastic container and removed the lid. 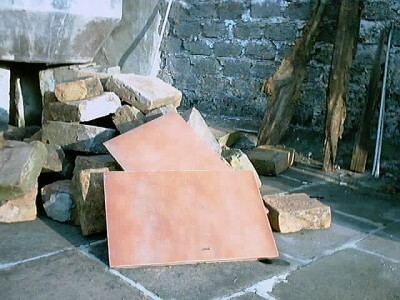 Esme said: "I lift the stone, you catch it". And so we did. I put the container over the scorpion. The next step, moving the paper under the scorpion was a bit more difficult. I teared a small part of the paper and tried to push the scorpion on the bigger piece. It just moved on the small one, so with a bit moving around I was able to have the scorpion on the paper. Then I just turned the container in the right position and put the lid on. Scorpion caught, and we got ourselves a new pet. Esme wondered how we get scorpions on the roof, since this is the second one we have found. I guess that the first one, Tina, also got into our house via the roof. Moreover, last year, when I cleaned the stairs I found shedded skin of a very small scorpion (about 5 mm). My best guess is that they just climb the wall of our castle in the night. I still have plans to make a UV lamp using many UV LEDs since scorpions glow in the dark (see Stung by a scorpion), so maybe one day I will know. We went back down, and after cleaning the glass of "Tina's house" I put the scorpion in it. It had been used shortly to keep a ringneck snake we found. Sadly the snake was killed by ants I fed it, a few days after we found it. Just four or five bites where enough to make the snake move around like crazy and put it into a coma. I still want to email some people to obtain information on how this could happen. Since I kept the dead body of Tina, I was able to compare the size of the new scorpion to that of my first. The new one is indeed bigger. Like Tina, I think this one belongs to the Vaejovis group. Maybe I email "What's that bug" to find out for sure. 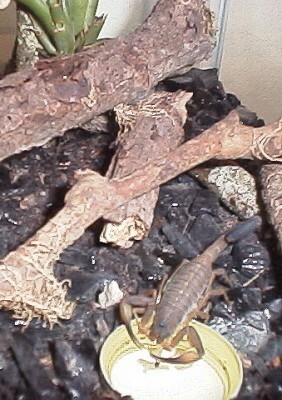 On August the 12th, 2004, I saw Tina the scorpion drink for the very first time and hence I took a few pictures. Tina drank a lot, and later I saw the scorpion bringing its tail to the "mouth", making it wet, and stroking its back with the side of the tail, making it very wet. I have no idea if this was just ordinairy grooming or something else. Hopefully I am able to observe this behavior in my new pet too so I can get a better understanding of its meaning.